TAMPA, Fla., Jan. 16, 2019 /PRNewswire/ -- Aiming to bring greater freedom and comfort to people traveling in wheelchairs or with limited mobility, Winnebago (NYSE: WGO) has launched three accessibility-enhanced motorhomes, the Intent 30R AE, Adventurer 30T AE, and Forza 34T AE. The new wheelchair-friendly models, based on the company's 40 years of experience customizing its models for customer accessibility, are available in three standardized floorplans that include the most commonly requested options. The standardization of floorplans aims to make the accessibility option more visible to customers, as easy to purchase as a standard Winnebago, as well as provide economies of scale to help reduce costs to customers over time. The new models will debut at the 2019 Florida RV Supershow January 16 - 20, 2019 at the Florida State Fairgrounds in Tampa, Florida. "Before our accessibility-enhanced Winnebago, the thought of going on vacation was more stressful than just staying at home," said Mike Freeman, Winnebago Forza 34T owner. "Most people take for granted the ability to hop in a car, plane, train at will to take a vacation, visit friends and family, or explore a new destination. Our accessibility-enhanced RV has opened up a wider and richer world for our whole family and even makes day trips easier. We can leave the house with confidence, and excitement, rather than anxiety and stress. I hope more people like us will discover their freedom and adventure with Winnebago's new offerings." According to the U.S. Census Bureau, 2012 report, there are around 3.6 million people over the age of 15 who use a wheelchair, with an additional 11.6 million people using a cane, crutches or walker to get around. To serve these large markets, Winnebago goes beyond offering customers a sense of travel and adventure with an accessibility-enhanced motorhome. These vehicles reduce the need for extra planning related to out of town or local travel, provide more options for service animals, and give owners comfort in knowing they'll always have a wheelchair-friendly bathroom and sleeping arrangement. "Our accessibility-enhanced customers are looking for the same freedom from home that many RV owners seek and in many cases the ability to travel is much more meaningful. Over the past four decades, we've optimized our accessibility enhancements to take them beyond simple add-ons, to developing them into design features founded in countless real-world experiences and with Winnebago's legendary construction standards," said Ashis Bhattacharya, Vice President, Strategic Planning and Specialty Vehicles. "RV dealers across North America count on Winnebago for superior quality and innovation, and we look forward to making these options easier to stock and obtain as we understand options for accessibility that are available to drive off the lot are hard to find in the broader industry." 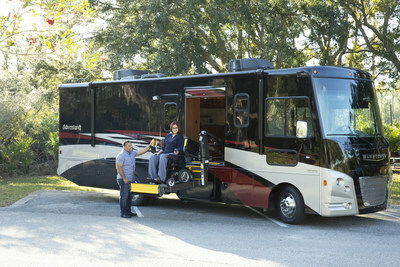 For more information about Winnebago's accessibility-enhanced vehicles, visit https://winnebagoind.com/product-classes/accessibilty-enhanced.